To make it in this wild wacky world, you need to re-examine your basic assumptions about nursing, life, liberty, and the pursuit of happiness. Come learn how to lighten up, let go, and loosen up so you can take the risks you need to live the kind of life you really want. The future is now and the choice is yours. How to use laughter to loosen up the places that may have hardened your nurse heart. Time-tested tips for neutralizing negativity and dealing with adversity. Learn when to let go, when to take action and how to be your own personal leader. How to create more Lightness of Being in your life and practice. The I’s have it: Implementing change, through Innovation, Integrity and Initiative. Moving from Certainty to Curiosity. The Seven Deadly Needs and how they interfere with one’s ability to have a life. How and why words matter: Impact versus Intention. 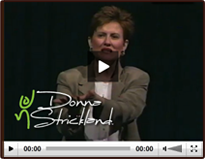 In this fast-paced, dynamic, and interactive presentation, Donna provides proven practical principles for “Savin’ Yo Self!” We find ourselves in a New World, and we’ve got to become New People if we are to be successful. Are you ready?